So I'm just researching 22LR lever actions for someone rejoining the hobby after a long time. Wondering if I missed any as 22LR levers not really my area? Current Henry- has aluminium and plastic parts? Marlin 39A- are they still in production? Any I missed or thoughts in general? For the money, I think the Henrys are great. There are two different grades though, and I don't know the details but the used one my son bought had a plastic ramp and sight on the front, but we were able to order the better version from Henry and upgrade the rifle. Used Winchester's and other 92 clones are out there as well that you might find for a decent price. My personal favorite is the Ruger 96/22, and I have one that has an inner girly suppressed barrel* The barrel is actually one they make for a Ruger 10/22, but it is easy to modify for installation on the 96. It makes a great pest elimination rifle as well as beginner gun for new shooters since the noise is eliminated pretty effectively. Ruger 96/22 LR with 'Operative' replacement barrel - integrally suppressed. I know it isn't 'traditional' but I mounted the TruGlo optic on it because since it is suppressed it is my favorite 'newbie' teaching rifle. I had a second 22 WMR one I converted to 17 HMR, but I think it would explode a squirrel unless there is non-fragile bullet loads you can get. Last edited by AJMD429 on Sat Dec 08, 2018 8:27 pm, edited 2 times in total. I have two Marlin 39As, one is a Century LTD, that's quite accurate but has to be cleaned every hundred rounds or so to feed properly. The other one I have was made in the late '50s and is one of my favorite .22s, feeds everything and can go through a whole brick of 22lrs or more w/o needing to be cleaned. I've had a couple of the 9422s and they worked fine, I sold them after they were discontinued and shot up in prices. Good luck on your search, that's part of the fun! The Marlin is now a custom shop gun and come at a very high price. I am told. I bought mine about 5-6years back ,A very accurate rifle ,made before Rem. buy out. Wondering if I missed any as 22LR levers not really my area? Any I missed or thoughts in general ? Last edited by Pete44ru on Thu Dec 06, 2018 9:40 pm, edited 1 time in total. and my favorite of all is the 1897 marlin, deluxe, with 28" tapered octagon barrel, tang sight, etc and it really shoots well. Skip the Ithaca's, they're junk and made of soft metal. I'm sure someone will be along to tell me I'm wrong, but I was given one as a teenager by a family friend that didn't know anything about firearms. Total piece of junk. Anything that says Marlin, Winchester or Browning will do what you need. Henry too, from what I hear but I've never shot one. Henry's rifle is built under an older ERMA patent. It is a keeper! they seem to work well and are accurate in my experience. I have one 22 lever gun, a Marlin 1897 Texan. Sweet little rifle. I have several of the afore mentioned 22 levers and most will do what you want. I have recently been playing with my Marlin model 57 and am impressed with it. Still want an older 39 but for now this will do. Norinco made one too, although no doubt a copy of someone else’s. I'm not impressed with the Henry rifles, but the 9422's and 39's are great fun guns. I always loved the looks and short lever throw on the BL22's though. I never owned one of the Rugers. I'm sure they're good guns, but they just don't have the classic lever gun look to me. Yes thats why I sort of left the ruger 96 and some of the rarer historical pieces out of the question. More after traditional lever types and they want something still pretty common or still in production. Thanks all for the info though, there are some great lists of information above by Pete44 and hfcable. Btw the Chinese norinco mentioned is the Jw21 , just googled it. I've been shooting targets like this for several years with my Henry carbine. 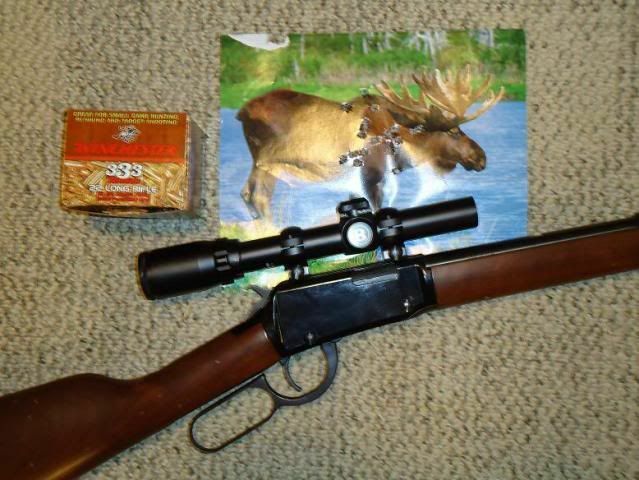 Scope is Bushnell 1.5 to 4.5X. It's a keeper! I did the Henry Golden Boy marathon endurance run. At 22,000 rounds, when it started to show extraction problems, I cleaned it for the first time. I ran it to 28,000 rounds total, replaced one extractor myself. After the run, shipped the gun back to Henry for analysis, it was returned with ONE part replaced. The coil locking block spring had busted into three pieces along the way, but the gun had continued to function to the end of testing. Henry found no severe wear or tolerance changes needing refurb. I bought that gun at the end, I was that impressed. No plastic parts on the Golden Boy. I had a BL22 many moons ago, what no good. it couldn't shoot a 3" group at 25 yds. I even tried scoping it but it still wouldn't shoot so down the road it went. I've shot a few Henry's, I like them, smooth and accurate enough. I did a head-to-head between a BL22 & a Golden Boy. Slicker & more accurate at 50 yards. My grandson has a standard Henry and it shot as smooth as my 1917 Model 92 32wcf right out of the box. That thing is probably as accurate as my old Remington 551-A bought new in 1954. I have a 9422, BL22 and shot a Henry to compare it with the Browning. The Browning and the Winchester are both very accurate. I use 9mm cases as 20 yard targets with them, and hit them with regularity. When I compared the Browning and Henry, I was using open sights at 15 yards. The Browning had a finer front sight and shot tighter groups than the Henry. The Henry was smooth as silk. Its a fine rifle. I gave that rifle to a relative and the front barrel band broke. It was made of plastic and had the front sight on it. He called Henry, and they sent him a new barrel band made out of metal at no charge. I know there are others who have experienced Henry's outstanding customer service too. Of the three, I would go to the Browning if I needed to kill something. It is consistently a tack driver. thanks folks they went for the browning , it got enough reasonable votes and they liked the way the lever throws. One thing people need to do is stop regurgitating OLD stories about OLD plastic on the Henrys. Those plastic front sight assemblies were ONLY on the bottom entry-level .22 leverguns, never on the higher-end Golden Boys & other models. And Henry stopped using plastic there 10 years ago. As far as the Henry vs Browning goes, I tested several rounds through both rifles off the bench at FIFTY yards, a more realistic rifle range. Besides a better trigger on the Henry, and a much slicker action than the Browning, the Henry sights were more precise, and it simply shot tighter 5-shot groups. The Browning sights were harder to get a steady & repeatable sight picture through. If you like the Browning, it's a neat little gun. I've worked with three of them over the years. The Henry was just more shootable over all for me.